Q: Is it Achilles or Adolph? A: The name is Adolph. A few publications, have listed Adolph Hegewisch's name as Achilles. This can be traced back to the Local Community Fact Book: Chicago Metropolitan Area published in 1938 . This is the earliest published account listing Hegewisch's first name as Achilles. Why the name was changed is speculation. It may have been an honest mistake or may have been because the name Adolph reminded people of Adolf Hitler. From that point until around 1980, Hegewisch's first name was given as Achilles. However, numerous articles about Hegewisch (the man) appear in the NewYork Times. These articles date from 1880s and 1890s and give his name as Adolph and on one occasion Adolfo. His namesake nephew, Adolfo Hegewisch, a Mexican Businessman, visted Pressed Steel Car company in the 1950s. Q: What about the Adolfo Hegewisch who runs Toyota in Mexico, are they related? A: Yes. He would be a grand nephew to the Hegewisch founder. Q: Who is Mann Park named after? Was it always Mann Park? A: Mann Park was originally known as Hegewisch Park. The name was changed to Mann Park in 1922. It is named after James Mann, an alderman for the 32nd Ward from 1892-1896 before becoming a U.S. Representative for Hegewisch's Congressional district. 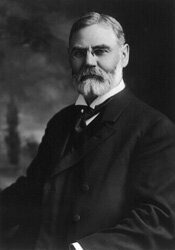 He served in Congress from 1902-1922. He is best known for the legislation that bears his name, the Mann Act. This was a law which gave Federal Prosecutors the ability to to try persons engaging in transporting women across state lines for immoral purposes. The purpose of the law was to break up illegal kidnapping rings that were forcing women into prostitution (white slavery). 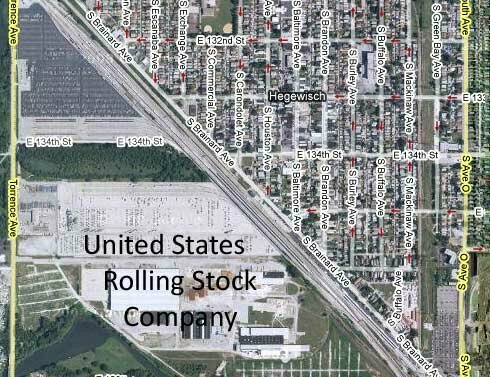 Q: Where exactly was United States Rolling Stock Company located? A: That depends. 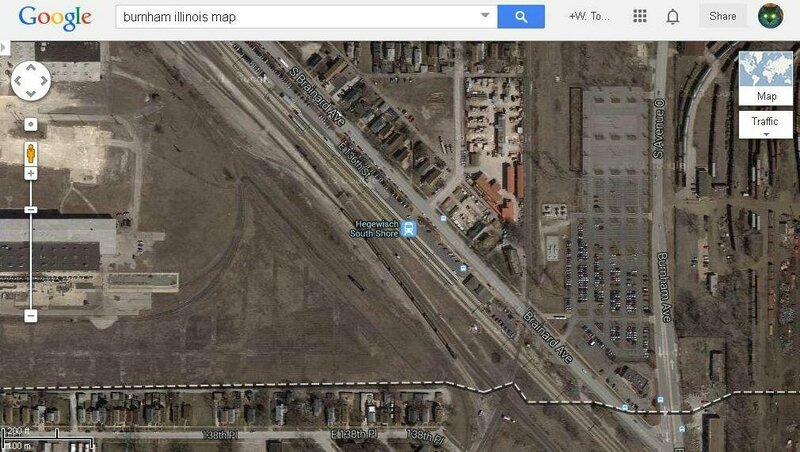 The short answer answer is the shops were located north east of where the present day South Shore Station in Chicag is. As you wait for a South Shore train today, and look across the Norfolk Southern switching yard you can see some old light blue buildings. Those buildings are all that is left of U.S. Steel in Hegewisch. Those buildings once belonged to Presses Steel Car Company, a predecessor of USRS Co. The long answer is more difficult. At the time of its demise, USRS was thought to be the largest manufacturer of rolling stock (freight cars for railroads) in the United States. The company had its headquarters in New York City but it had shops in Hegewisch (the largest) as well as Decatur, Alabama; Anniston, Alabama; and Urbana, Ohio. The principle share holders of the company were principally from London, England. 1892 map locating USRS Co.
Q: Was the first priest of St. Florian Church really murdered? A: Yes. 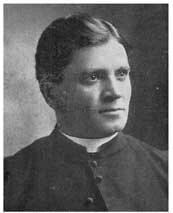 Rev Florian Chodniewicz was murdered in the St. Florian Rectory. Shortly after midnight on January 22, 1922. a burglar broke into the Rectory attempting to steal Sacramental wine. Rev. Chodniewicz interrupted the burglar and was shot. He was initially tended to by a physician at the scene and moved to a St. Margaret's Hospital in Hammond during the late morning hours. He died later that evening. According to police reports, Rev. Chodniewicz was 60 at the time. The crime was listed a "prohibition related crime" due to the attempted theft of alcohol. A man named Charles Majewski was charged with the murder but was released due to lack of evidence. Almost two years later, Edward Frenenski confessed to the murder, however the police did not believe the confession Frenenski was tried and convicted on other charges. The case is among Chicago's cold case files most likely because the assumption, at the time, was Majewski had commited the crime even if it could not be proven. Q: Is the Hegewisch Branch of the Chicago Public Library built on top of an old Native American burial ground? A: Only if Native Americans had a habit of burying their dead in swamps. 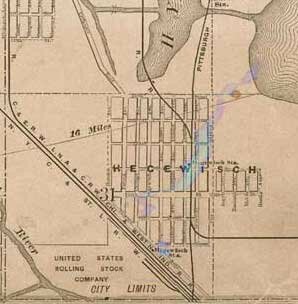 In 1890, the area around 130th and Houston was a marsh located a few hundred feet from the edge of Hyde Lake. The "indian burial ground" rumor began long before the Library was built. The same corner had also been the location of a Baptist Church which was supposedly haunted. A similar rumor claims the Library is haunted due to the murder of the pastor of that Church. Unfortunately that rumor was based on the wrong pastor, wrong church, and wrong denomination! (see above) Take it for what it is worth. Q: Did the Ford Plant really make tanks in World War II? *While manufacturing of the M40 began during World War II only one M40 was deployed to Europe duirng the War. It was deployed and found use with the Army after the War ended. Q: Where is Hegewisch Lake? A: Hegewisch Lake or Hegewisch Marsh is loacated south of 130th Street and stretches from Torrence Ave. to The Little Calumet River. It is currently being restored. The marsh covers approximately 100 acres. The marsh is home to numerous water fowl, beavers, deer and other animals you would not expect to see in Chicago. Q: So is the Ford Plant in Hegewisch or not? A: Technically the Ford Assembly Plant is in South Deering. Hegewisch extends north, east of Torrence Ave. and west, south of 130th Street. The Ford Plant is located just north-west of 130th and Torrence in the far south-east corner of South Deering. However because of the lack of population in South Deering and the isolation of the plant from the rest of the neighborhood it has almost always been refered to as the Ford's Assemply Plant located [near, at, in] Hegewisch. Q: I heard the Hegewisch Little League Field and Babe Ruth Field are actually in South Deering. Is that true? A: Now that is a good bar bet! It is true, at least according to the official Chicago neighborhood map. However once you win the bet, you may need to see a dentist so he can put your teeth back in your gums. Q: What about Mount Saint Hegewisch, the CID landfill? Is it or is it not in Hegewisch? Currently the border of Hegewisch extends all the way to the Bishop Ford Expressway. The CID landfill dates from the early 1980s and is currently closed to expansion. In 2004 Waste Management, its owners planned to turn it into "Gateway Park". It was met with stiff opposition by the communty and Alderman John Pope. Q: I heard the Hegewisch South Shore Station and the Burger King are actually in Burnham. What's the deal? Contrary to the rumor, both are in Hegewisch. The confusion is caused by Brainard Ave. and the lack of actual streets in the last 1/4 mile of the city. Brainard Avenue runs at an angle as it heads out of the city and the last actual intersection is at 136th street. The city limits, however, extend to 138th St. The map below marks the actual city limit with Burnham. A you can see only the corner of the Brainard/Avenue O intersection is in Burnham. (this is where Ave. O becomes Burnham Avenue.) The Burger King and its parking lot as well as the South Shore Station is north of the Burnham border. Q: Why do I sometimes get US mail addressed with the address Burnham Il, 60633? Hegewisch and Burnham share ZIP codes. Both are 60633. Junk mailers will often send mail to Hegewisch residents with the proper name and street address but with Burnham instead of Chicago as the city. The same thing happens to residents in Burnham. Q: What happened to the street near 130th and Saginaw, the large round circle in the asphalt? The scar is actaully a reminder of the Tunnel and Reservoir Plan, better known as the Deep Tunnel Project. 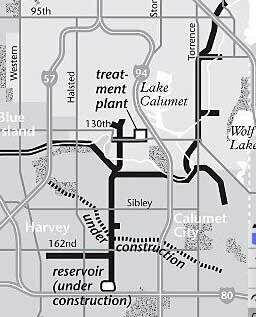 It dates originally from around 2003 when final stages of the Lake Calumet phase of the Deep Tunnel was being completed. The lrage mounds of dirt located near 130th and Torrence are aslo r reminders of the same project. The Deep Tunnel is a reservoir designed to accept raw sewage and strom run off and store it until it can be treated instead of forcing it to be released into the Calumet River, or other nearby bodies of water.